Remember the Volvo from the first Twilight book? 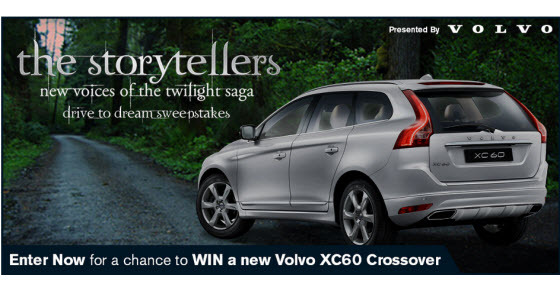 Volvo is taking advantage of its Twilight connection and has launched a new contest to coincide with The Storytellers: New Voices of the Twilight Saga. In addition to the contest, you can test your Twilight Knowledge with their trivia contest. You can get extra entries for voting in the Storytellers: New Voices of The Twilight Saga Contest, sharing the promotion through Twitter, and sharing the promotion via email. The contest ends July 22, 2015.
are the most valuable after all these google algorithm updates.